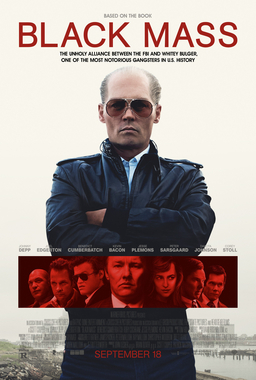 ‘Black Mass’ is an accomplished crime film focusing on the exploits of James ‘Whitey’ Bulger, a brutal mobster from South Boston who became an FBI informant. Johnny Depp stars as Bulger in his finest performance in years, moving away from his recent raison d’etre of playing eccentrics to play a psychopathic gangster with a dark twinkle in his eye. Depp’s physical transformation to resemble Bulger is superb, from a receding hairline to the piercing blue eyes that dominate the camera throughout every scene. Depp gives off an air of power and dominance that makes Bulger an utterly compelling figure to watch and his performance raises the film above standard gangster crime fare. A film about Bulger has been mooted for a while, with Ben Affleck linked for a period of time (this was oft-seen as the third leg in his unofficial Boston trilogy following ‘Gone Baby Gone’ and ‘The Town’, before it landed in the hands of Scott Cooper (‘Crazy Heart’, ‘Out of the Furnace’). Cooper does a good job from behind the camera to cover a large period of time and create a gripping story that nonetheless depicts Bulger for the monster that he was. The film uses the framing device of police interviews with Bulger’s accomplices to tell the story of Bulger’s rise in Boston, particularly focusing on how he used a relationship with FBI agent and childhood friend John Connolly (Joel Edgerton) to eliminate rival gangs and cement his ‘Winter Hill gang’ as the leading criminal enterprise in Boston. Whilst the film does dabble in gangster movie tropes a little too often, the FBI link and Depp’s performance are the two elements that provide ‘Black Mass’ with its intrigue and drama. The FBI scenes are every bit as engrossing as those focusing squarely on Bulger and Cooper does a good job of showing how the actions of Bulger and Connolly start to weigh heavily on the consciences of their friends, families and colleagues respectively. In a tale spanning two decades, the film does to an extent succumb to the biopic effect of trying to drop in on too many events, and some of the storylines and supporting characters feel a little underserved (Benedict Cumberbatch as Bulger’s senator brother Billy in particular feels unnecessary to the main plot), but the quality of casting does ensure that the acting in every scene is of the highest standard. ‘Black Mass’ is a good film featuring a great central performance, but I can’t help feeling that this could have been a true classic if Depp’s frightening performance was surrounded by a tighter script with a narrower focus.